Doctor with senior patient in office stock photo from michaeljung/Shutterstock. Despite the amount of wealth and power that exist in the Washington region, the benefits of living in the area do not extend equally to all its residents. DC and the surrounding suburbs have positive health outcomes well above the national average, but when you look closer at the data, there are stark differences from neighborhood to neighborhood. In fact, there's a 27-year disparity between the region's census tracts with the lowest and highest life expectancies. 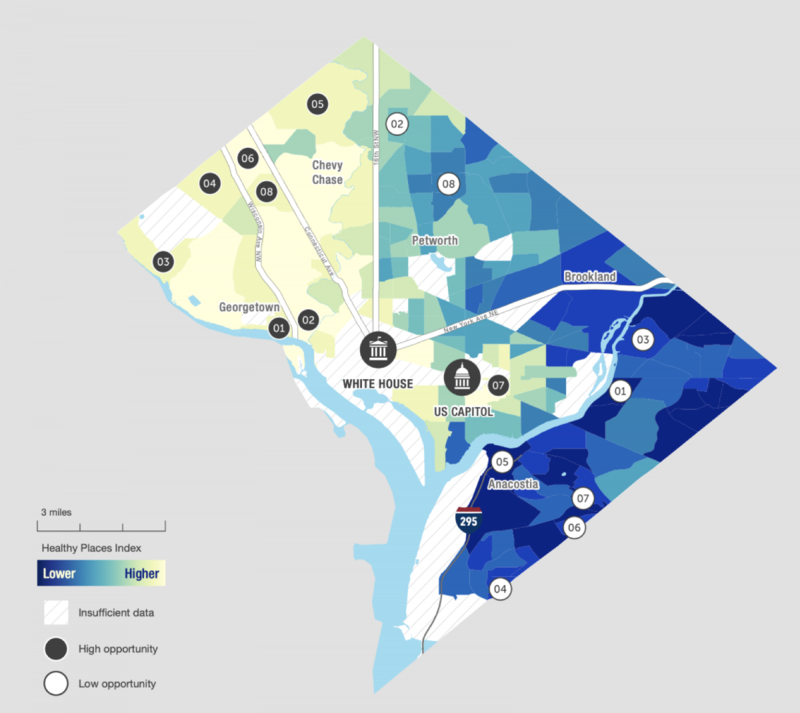 “The census tracts with the lowest and highest life expectancies were both in the District, ranging from 67 years in a neighborhood of Trinidad near Gallaudet University (tract 88.04) to 94 years in the Foxhall area of Georgetown (tract 8.01). Other reports have shown striking geographic differences in other health measures such as infant mortality, obesity, heart disease and diabetes,” says a recent report from the Metropolitan Washington Council of Governments (COG) along with the Virginia Commonwealth University (VCU) Center on Society and Health. Uneven Opportunities: How Conditions for Wellness Vary Across the Metropolitan Washington Region examines the health disparities throughout the region by measuring the differences in life expectancy across census tracts and looking at the extent to which social determinants of health—such as housing, transportation, wealth, and education—contribute to those differences. So how are these health disparities explained? First, we should start with what doesn't have much of an impact. The report addresses a couple of misconceptions that surround health care discussions, such as the idea that health is primarily determined by health care, and that a person's health care choices rest solely with that individual. In fact, only 10%-20% of someone's health is determined by health care. 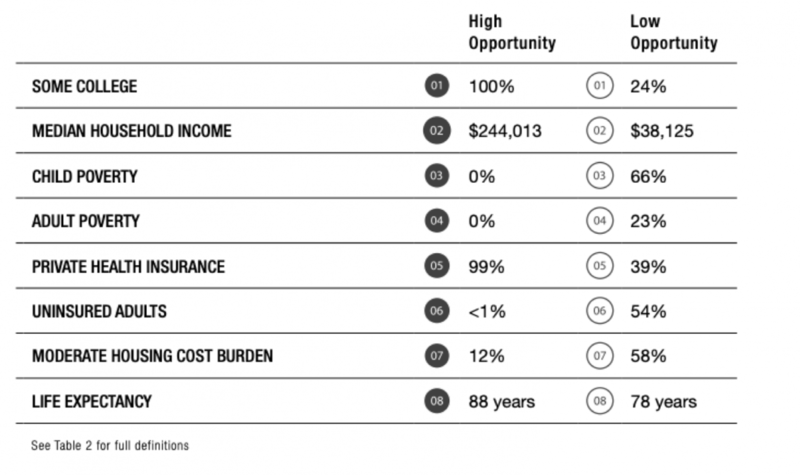 The place where a person lives (and the opportunities found in that place) often have a more significant impact on a person's overall health outcomes. That's because people can only make the choices they actually have. For example, exercise contributes to health, but if a person lives in a neighborhood with unsafe roads and has to travel a long way to work, she doesn't really have the choice of commuting by bicycle or on foot, even if she wants to. Someone might want to cook healthy meals with a lot of vegetables, but if they can't access a grocery store (like many people living east of the Anacostia River), they don't really have that choice. 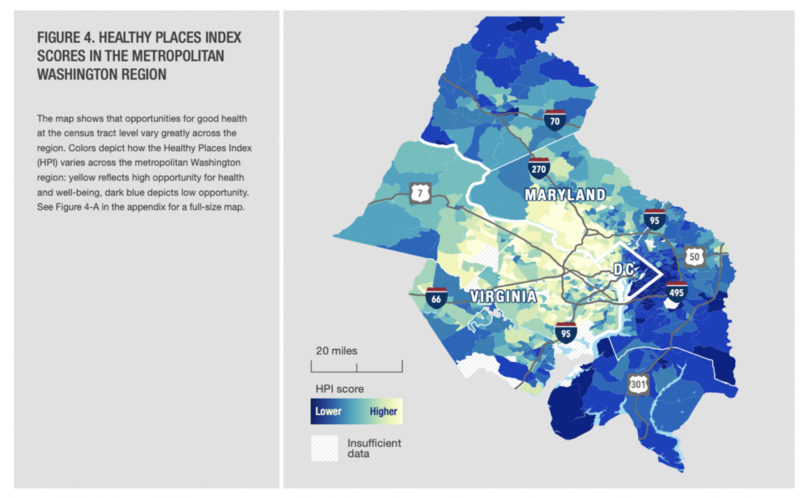 “Overall, findings show that health in metropolitan Washington is shaped less by health care than by factors like income, education, housing, transportation, and the environment. In addition, people of color and immigrants were more likely to live in neighborhoods with fewer resources, which lack the conditions for good health,” the report says. Unsurprisingly the healthiest places (lighter colors) in metropolitan Washington are in the northwest wards of DC, the affluent suburbs of Maryland, and most of Fairfax County. The least healthy places (darker colors) are in the eastern wards of DC, Frederick County, Frederick City, southern Charles County, and southwest Prince George's County. 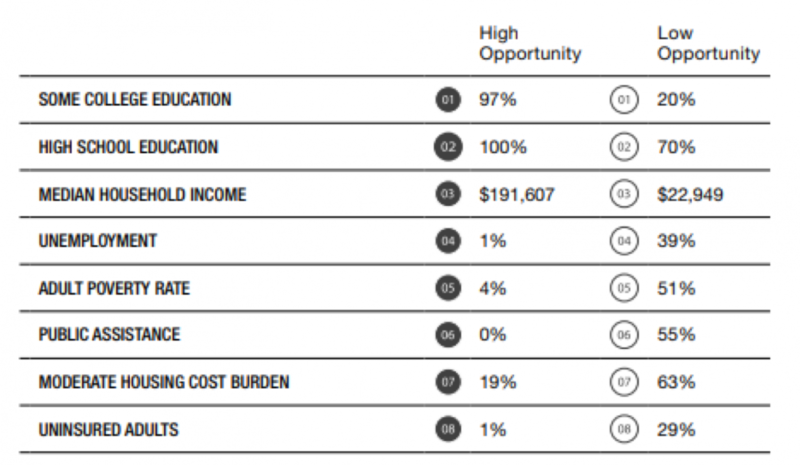 There is a clear east-west divide in DC when it comes to health opportunity. 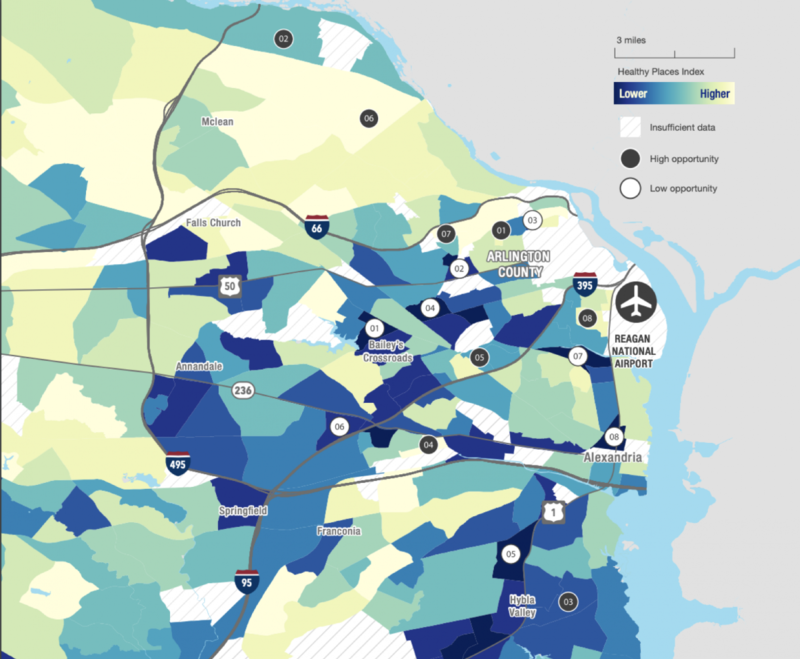 The wards located in the northwest part of the city are wealthier and more educated and thus have a higher opportunity for health, as opposed to the wards in Southeast DC. The study compared Ward 3 in Northwest DC to Ward 8 in southeast DC and found that the average life expectancy in Ward 3 is 87 years versus 72 years in Ward 8. 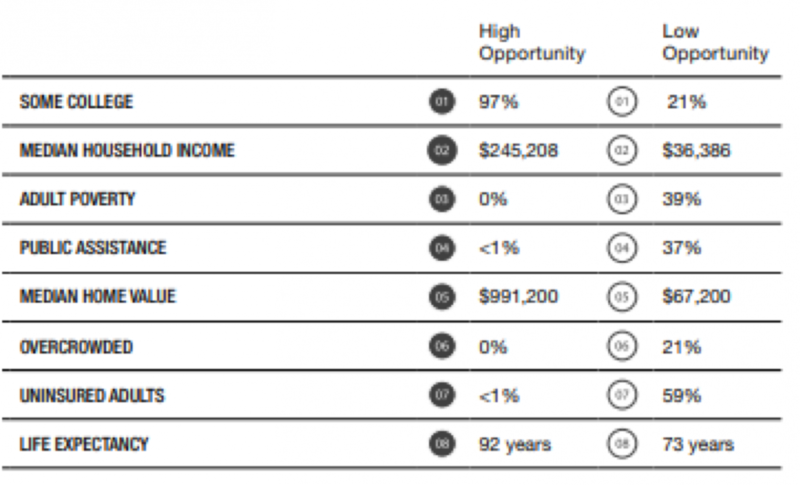 While 94% of Ward 3 residents have attended college, only 41% of people have in Ward 8. For example, Bethesda has a majority-white population and in some census tracts at least 97% of adults attended college, and the unemployment rate is less than 1%. However, just eight miles away lie some of the county’s most adverse health conditions. That's likely because Langley Park has a high immigrant and racial minority population. 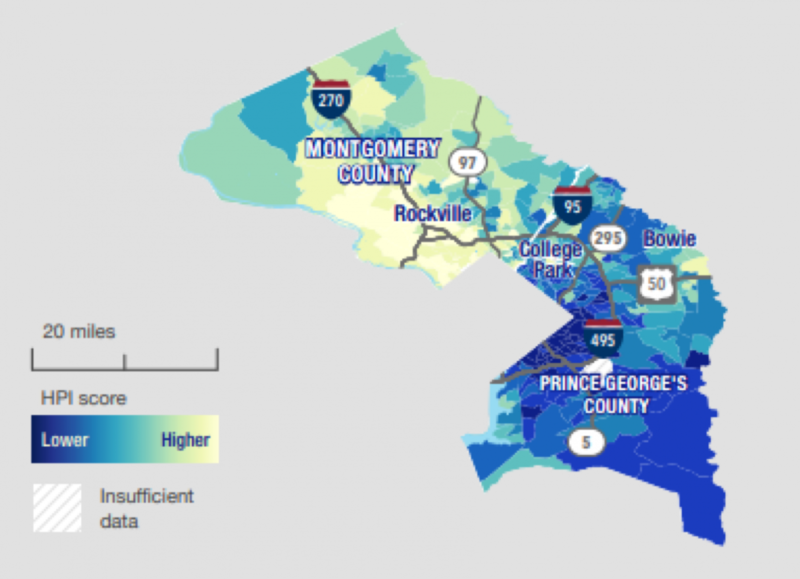 Just like in DC and Maryland, the health disparities that exist in Northern Virginia are a short distance from affluent areas. For example, census tract 4701 in Great Falls has a median household income of $244,013, but nearby in Fort Myer, 66% of children are living in poverty. The irony of the Washington region is that there is a considerable amount of wealth and opportunity available to residents, but those opportunities are unevenly spread—at no fault of the individual. The “islands of disadvantage” in Northern Virginia and the segregated areas of Southeast DC and Prince George's County are reflective of a past that has contributed to multigenerational poverty. This has induced conditions that adversely impact residents' health by limiting access to social determinants that help people be more healthy. As noted in the report, “Doctors cannot solve the socio-economic challenges or improve neighborhood conditions.” Moving forward, the region must work to improve economic and social conditions for populations in need, straighten out the public health system, invest in communities, and ensure access to quality health care service in every neighborhood.